Where We Stay: The retreat will be held at Ebbio an 800 year-old classic Tuscany farmhouse converted into a stylish yoga retreat. The ambience of Ebbio offers a one-of-a-kind experience. Ebbio is a magical place surrounded by an evergreen forest, nestled in the heart of an old volcano that was sacred to the Etruscans. 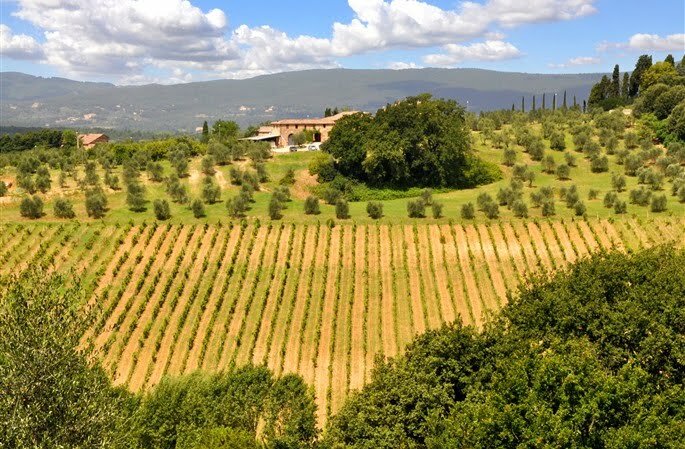 Located in the breathtaking countryside of Tuscany, Italy, it is only 25 miles from Florence, eight miles from Siena, and a half-hour walk from Monteriggioni, a little medieval jewel. You will be captivated by the undulating hills swept with thriving vineyards, olive trees and enchanting evergreen forests. The amazing part of Ebbio is that it is still a working Tuscan Farm. Meditation and Yoga Workshop: We begin the day with meditation taught by Paul, followed by breakfast and then a yoga session taught in Week#1 by Carol Nelson and Week#2 by Patty Townsend. Before dinner, Paul leads another a second meditation session. Experience The Senses: "Say it like you eat it" from Eat Pray Love Celebrate and enjoy the art, the food, the mediation and yoga, the views...fill the senses...la dolce vita!!!!! Daily Excursions: Each day offers another option for exploring one of the most remarkable areas of the world. We go the ancient cities of San Gimignano and Sienna. We hike to a Tuscan farm and winery for a scrumptious lunch and then luxuriate in natural hot springs. We explore small, unique towns each with their own unique charm. Trip Price Does Not Include Airfare or gratuities.